The spider has a bad wrap. We think of them as creepy and crawly when they're actually some of the smartest engineers in our little green world! One tiny spider can weave a geometric web that's a foot across and fourteen inches tall between two trees in only an afternoon. The thing is, we have a hard time even putting together an Ikea chair. And they say that humans are so smart! Versatility is key with this costume accessory! 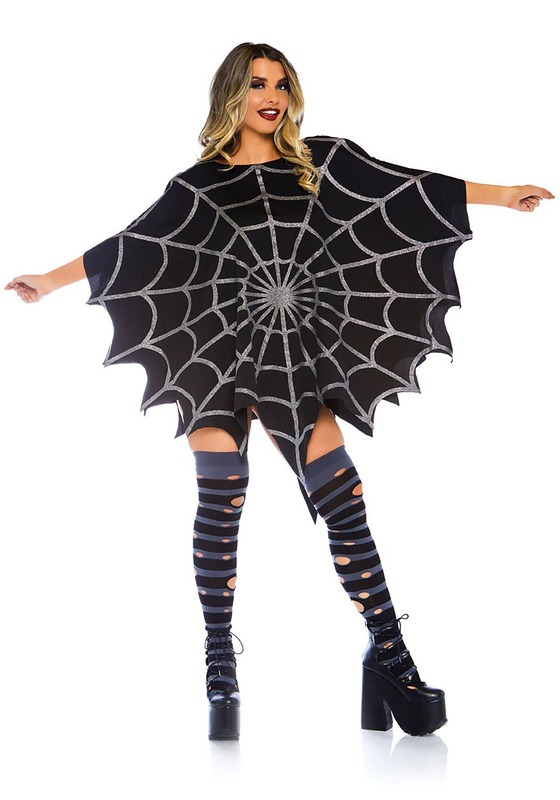 The black fabric is accented with a sparkly silver color, making the web stand out. The hem of the poncho has a webbed pattern, making your spooky silhouette stick out even from afar! Whether you're wearing heels or sneakers, this fashionable poncho will make a sleek entrance. Transferring a spooky ensemble from office wear to party mode was never so easy. From faux leather leggings to skinny jeans to a pencil skirt, you'll love having options. And while we might have given the spider plenty of credit in our earlier paragraph, we know our fear comes from its sneaky hunter nature. It feels good to have power. Take that into your own hands with this lovely silvery web poncho!